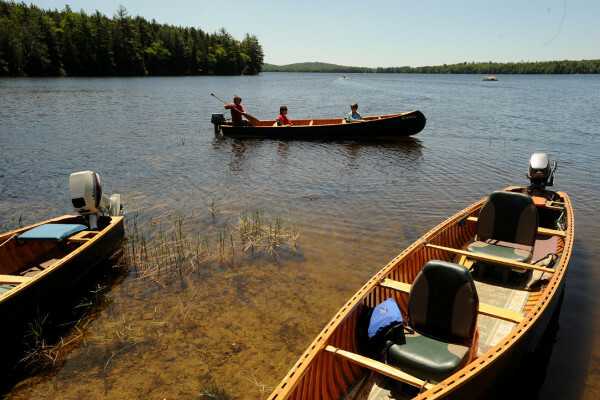 People head out in canoes for a tour of Wabassus Lake at the boat landing by the Downeast Lakes Land Trust. Other than Maine people, our state’s natural beauty and natural resources probably are our most important economic advantage. We have a long tradition of working together to manage our natural assets in a way that balances the perspectives of business, conservation, recreation, the timber industry and traditional uses such as hunting and fishing in a respectful, nonpartisan manner. Right now, that tradition and our state’s economy unnecessarily are being put at risk. The Land for Maine’s Future Program was created more than 25 years ago to secure public access for recreation; conserve our most important habitats; and preserve Maine’s working forests, farming traditions and commercial access to the coast. Six times voters have been asked to vote yes or no on supporting bond funds for Land for Maine’s Future, and six times they overwhelmingly have voted yes. Each time, it has won support from roughly 60 percent of Maine voters and more than 80 percent of Maine’s towns. The program enjoys broad support because it is nonpartisan and represents local partnerships among sporting groups, town officials, businesses, family farmers, private landowners, land trusts, state agencies and many others. Years of hard work in 37 local communities is jeopardized by news that Gov. Paul LePage intends to hold up funding approved by voters in 2010 and 2012 for as many as 36 projects affecting some 50,000 acres of conservation, recreation, forest and agricultural land and the economies of 13 Maine counties. Mainers across the state are upset because this is the second time the governor has refused to release the funds for unrelated political reasons. Now, 1½ years later, the governor’s representative informed the Land for Maine’s Future Board of Directors “he is not interested in selling more bonds at this time.” He will hold them up this time until the Legislature and conservation groups agree to his desire to increase the amount of timber harvested from Maine’s public lands. Any discussion of increasing timber harvest on public lands needs to be carefully balanced with how important those lands are to Maine’s overall economy and especially our rural economies. For example, we laud the goal of finding $5 million to help Mainers afford their winter heating costs and reduce their reliance on home heating oil. But a careful approach would be required to ensure any additional harvest does not endanger winter habitats and deer yards critical to Maine’s $231 million hunting economy. Key factors should include basing decisions on sound science; maintaining the “multiple use mandate,” which by statute ensures the public and sportsmen and women’s right to use public land; safeguarding wildlife habitat and ensuring sustainable forest management; maintaining adequate funding for Maine’s Public Reserved Lands, one of the state’s signature conservation programs; and not gutting funds for the Bureau of Parks and Lands. We also need to maintain public expectations for these important lands. Our public lands are home to 326 campsites, 150 miles of hiking trails, 35 boat launch areas and 131 miles of access roads. If LePage is truly interested in a healthy debate about lowering energy costs let’s have it without holding up voter-approved Land for Maine’s Future funds. Our public lands and the Land for Maine’s Future program are critical to our statewide economy. They also have a lot to do with the kind of Maine we will leave for our children and their children. That is why these issues have not been partisan in the past and shouldn’t become partisan now. Mike Tetreault is Executive Director of The Nature Conservancy in Brunswick, Maine and David Trahan is Executive Director of the Sportsman’s Alliance of Maine based in Augusta.